Easter Birthday Board - Printable DIGITAL FILE - Pastel Pink, Purple, Blue & Yellow Bunny Chalkboard - Girls Milestone Poster - Any Age! Commemorate your child's major milestones and favorites on his/her birthday with this customizable sign. I EDIT, YOU PRINT! Perfect to display at your child's EASTER birthday party or as a prop for birthday photos! ** Any of the sections can be swapped out for another AS LONG AS the size remains the same. For instance, instead of "FAVE TOYS", you could put "FAVE SONGS" with 4 listed underneath. *BUSINESS DAYS are defined as Monday-Friday, excluding holidays. Your turnaround time begins once BOTH your order AND information for your birthday board are received. I am often at least a day ahead of my listed turnaround times, so you *MAY* receive your files sooner than expected. HOWEVER, this is not a guarantee. When choosing your turnaround time, please allow extra time for revisions (if needed). ► Step 1: Select a TURNAROUND TIME from the drop-down menu. ► Step 2: Select a SIZE & COLOR SCHEME from the drop-down menu. ► Step 3: Add to your cart. ► Step 6: A proof will be sent to you within THE TURNAROUND TIME YOU SELECTED, as long as BOTH your order and information for your board are received. We can make as many changes as needed until you are satisfied with your design. Please allow 24 hours for each revision. ► Step 7: Once you approve your design, your files will be e-mailed to the e-mail address listed on your Etsy account along with some printing recommendations. Your files can be printed at any print shop (e.g. Staples, Office Max) or any photo lab (e.g. Walmart, Costco, etc). Bee Birthday Board - Printable DIGITAL FILE - Bumble Bee First Birthday Chalkboard - Any Age! Other Colors Available! Bee Birthday Board - Printable DIGITAL FILE - Boy Bumble Bee First Birthday Chalkboard - Any Age! Other Colors Available! Pink & Yellow Bee Birthday Board - Printable DIGITAL FILE - Bumble Bee First Birthday Chalkboard - Any Age! Other Colors Available! Donut Birthday Board - Printable DIGITAL FILE - First Birthday Donuts Chalkboard Poster - Any Age! Change the Sections! Fiesta Birthday Board - Printable DIGITAL FILE - Fiesta Birthday Chalkboard Poster - Mexican Party Sign - Any Age! Change the Sections! Boy Donut Birthday Board - Printable DIGITAL FILE - Boys First Birthday Chalkboard Poster - Any Age! Change the Sections! Mermaid First Birthday Board - Printable DIGITAL FILE - Purple & Teal Under the Sea Birthday Poster - Any Age! Other Hair Colors Available! Dinosaur Birthday Board - Printable DIGITAL FILE - Orange, Green & Blue Boys Dinosaur Chalkboard Sign - Any Age! Other Colors Available! Gold Glitter Little Man Birthday Board - Printable DIGITAL FILE - Boy 1st Birthday Mustache Chalkboard - Any Age! Other Colors Available! Llama Birthday Board - Printable DIGITAL FILE - Personalized First Birthday Milestone Poster - Any Age! Change the Sections! Transportation Birthday Chalkboard - Printable DIGITAL FILE - Boy First Birthday Board - Any Age! Change the Sections! 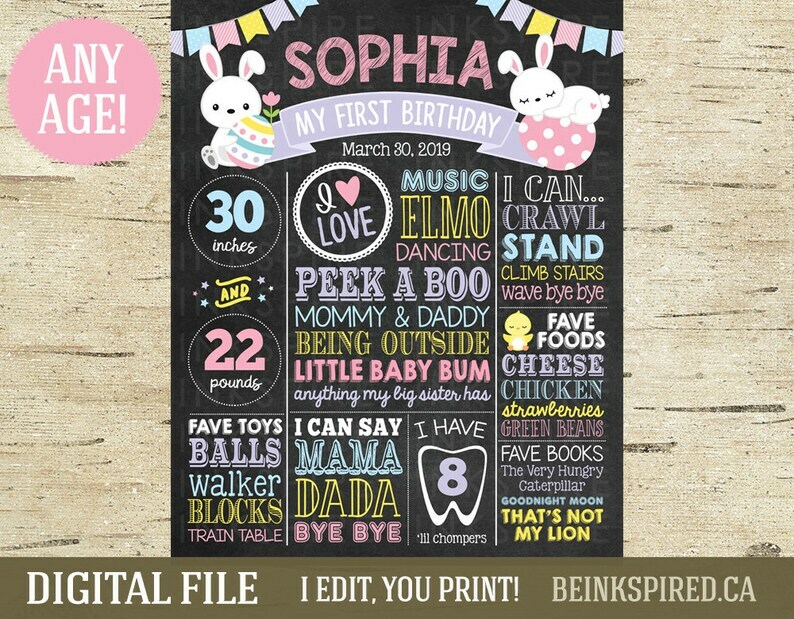 Girls First Birthday Chalkboard - Printable DIGITAL FILE - Red & Pink Ladybug First Birthday Board - Any Age! Other Colors Available! Ladybug Birthday Chalkboard - Printable DIGITAL FILE - Polka Dot First Birthday Board - Any Age! Other Colors Available! Ladybug Birthday Chalkboard - Printable DIGITAL FILE - Pink & Green Ladybug First Birthday Board - Any Age! Other Colors Available! St Patrick's Day Chalkboard - Printable DIGITAL FILE - Shamrock First Birthday Board - Any Age! Change the Sections!